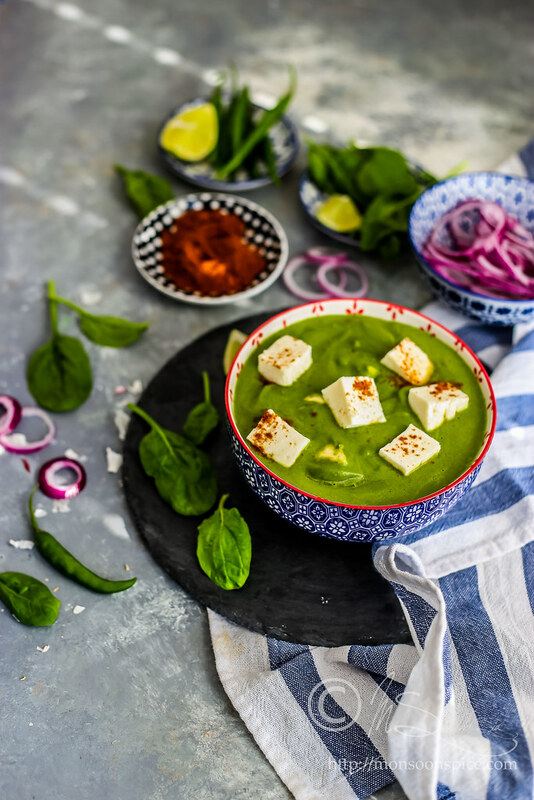 Place the spinach in a large bowl and fill it with water. Leave it aside for 2-3 minutes. All the dirt and sand will settle on the bottom of the bowl. Remove the spinach and place it in a colander and wash it under the running water to make sure it’s clean. If using spinach bunch, I prefer to wash individual leaves before chopping them to make sure that any dirt or sand stuck to the leaves and stems are removed. Set it aside until needed. Remove the peels of onion and garlic and thinly slice them. Remove the stems of green chillies and slit them in the centre. 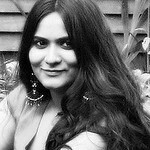 If you like, you can remove the seeds of the green chillies if you prefer mild curries. 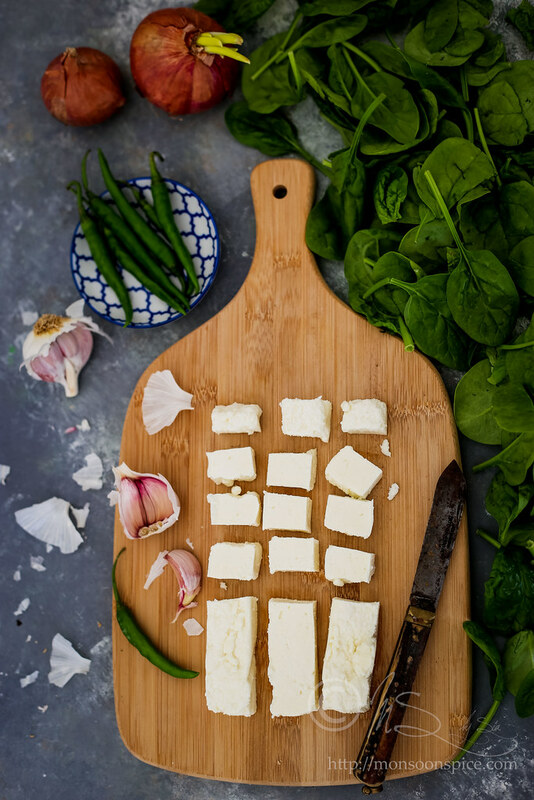 Cut the paneer into ¾ inch squares and keep it aside until needed. 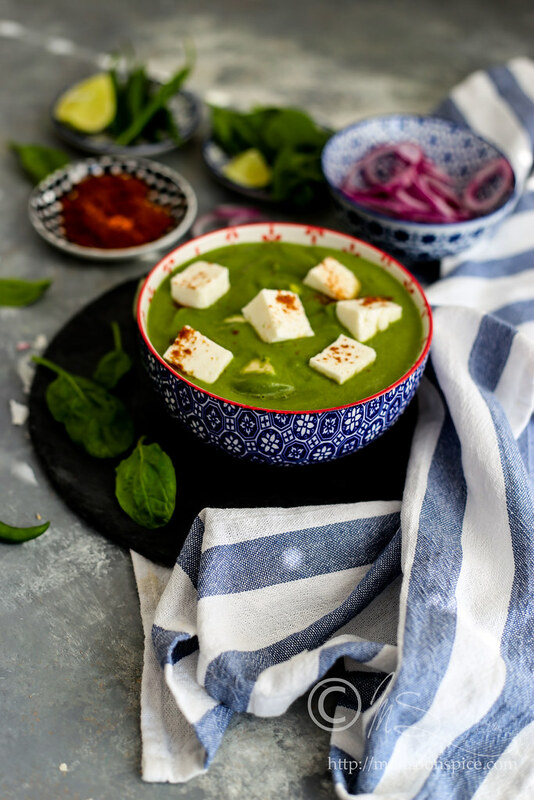 If using store brought paneer, you can place in a bowl of hot water for a soft paneer. 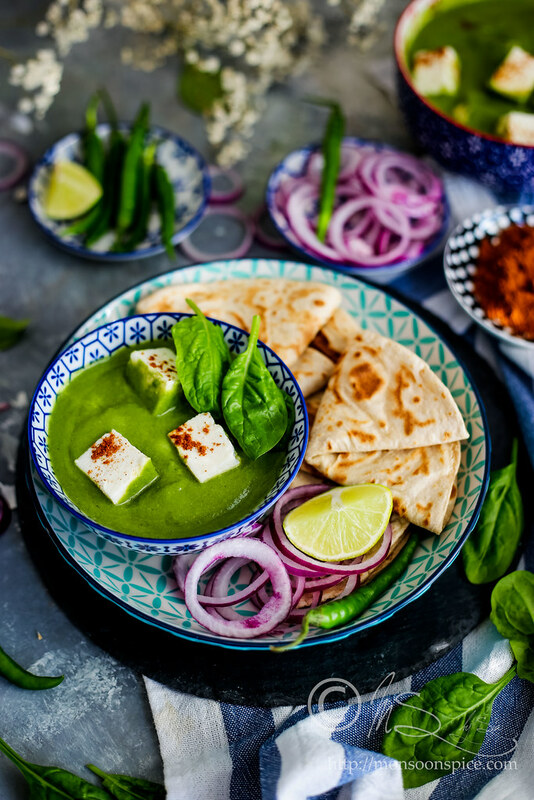 I have added the fresh paneer directly to the gravy, but if you prefer, you can pan fry the paneer cubes on both sides with little oil or ghee until they turn golden brown. Heat oil in a pan on medium flame and add cumin seeds to it. When the cumin starts to sizzle and change colour to deeper shade, about 30-45 seconds, add thinly sliced garlic and slit green chillies. Sauté for a minute until the edges of garlic slices turn golden brown, about 1-2 minutes. Next add the chopped onions, cashew nuts, sugar and a pinch of salt. The sugar helps in caramelising the onions and the salt helps in cooking the onions quicker. Sauté the onions for at least 5 minutes until the edges turn light brown and is lightly caramelised. This is an important step, and try not to rush to cook the onions. Finally add the spinach and mix them all well. Let the spinach cook for 3-4 minutes on medium heat until it welts. 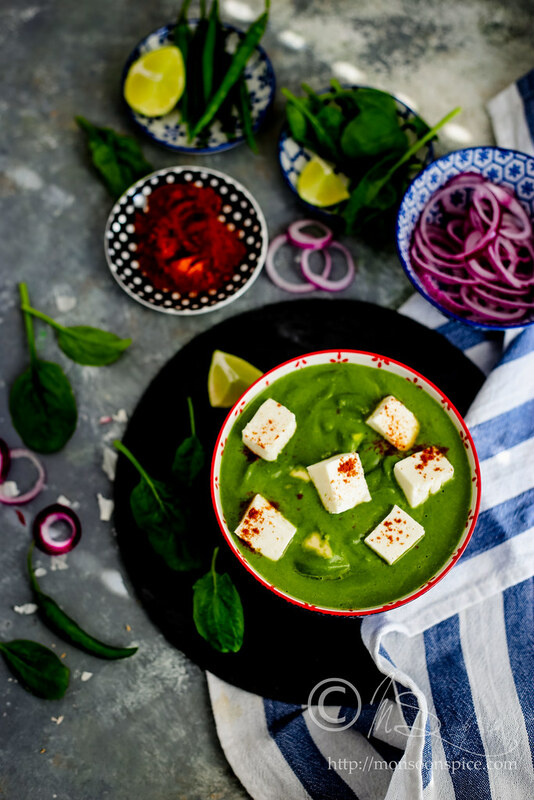 Transfer the cooked ingredients into a food processor and grind them to smooth puree by adding ½ to 1 cup of water. Make sure you scrape the ingredients stuck to the sides to get a smooth puree. Transfer the ground paste into a pan along with salt to taste and heat it on a medium flame. Add ½ - 1 cup of milk or water to get desired consistency. I prefer using whole milk to the gravy to get velvety smooth, creamy gravy. Take care as the hot gravy will spit and splutter as it comes to a boil and hence, cover the pan with lid to avoid hot gravy splattering all around. Cook for 2-3 minutes on medium flame. Add the cubes paneer pieces and garam masala and mix them all well. Cover and let it simmer for another 2-3 before turning off the flame. 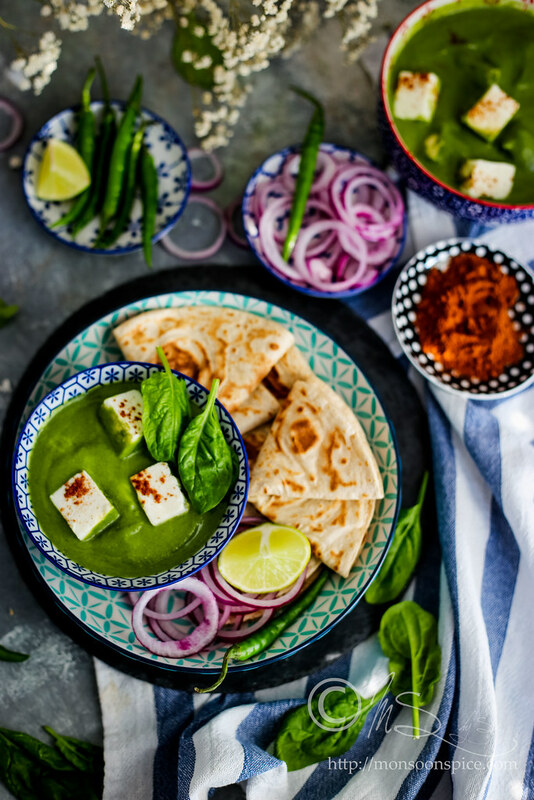 Let the Palak Paneer Curry rest covered for at least 10 minutes for all the flavours blend well before serving it hot with any Indian flat breads or flavoured Basmati rice. Enjoy! 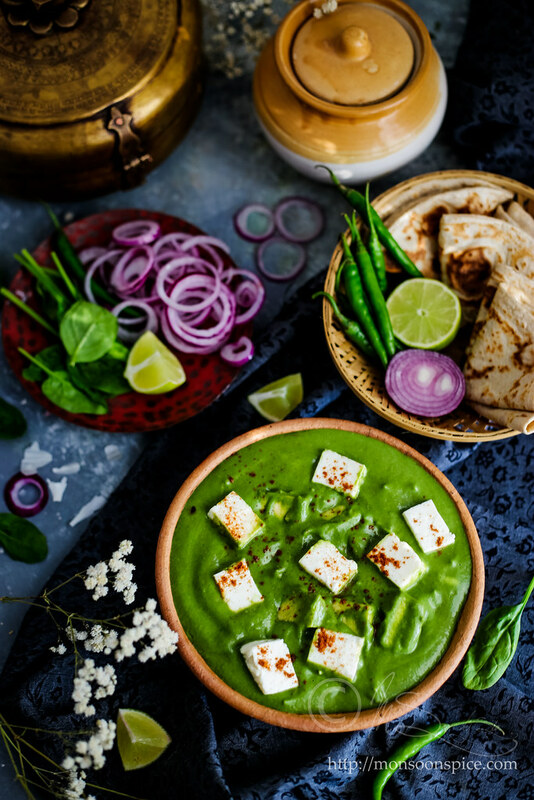 I have used the fresh paneer directly to the gravy, but if you prefer, you can pan fry the paneer cubes on both sides with little oil or ghee until they turn golden brown. Sauté the onions for at least 5 minutes until the edges turn light brown and is lightly caramelised. This is an important step, and try not to rush to cook the onions. I prefer using whole milk to the gravy to get velvety smooth, creamy gravy. You can skip adding milk and use any vegan milk or nut milk or water. 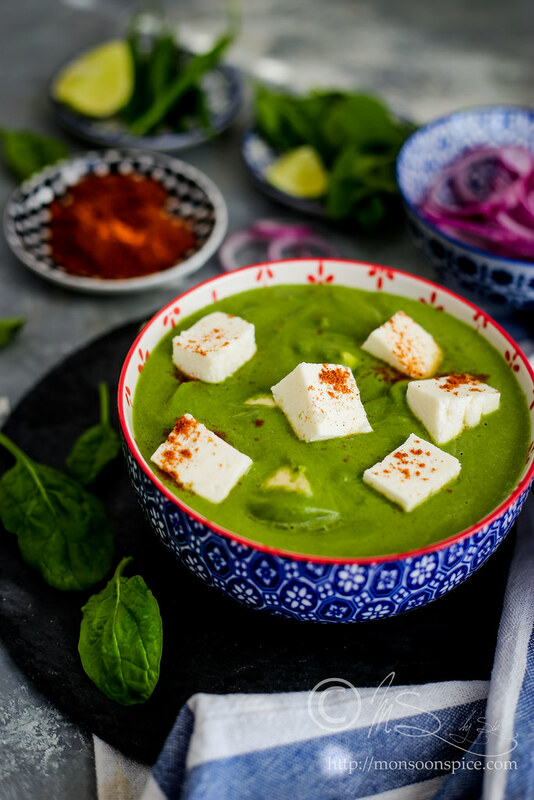 You can replace Paneer with firm Tofu for vegan meal. 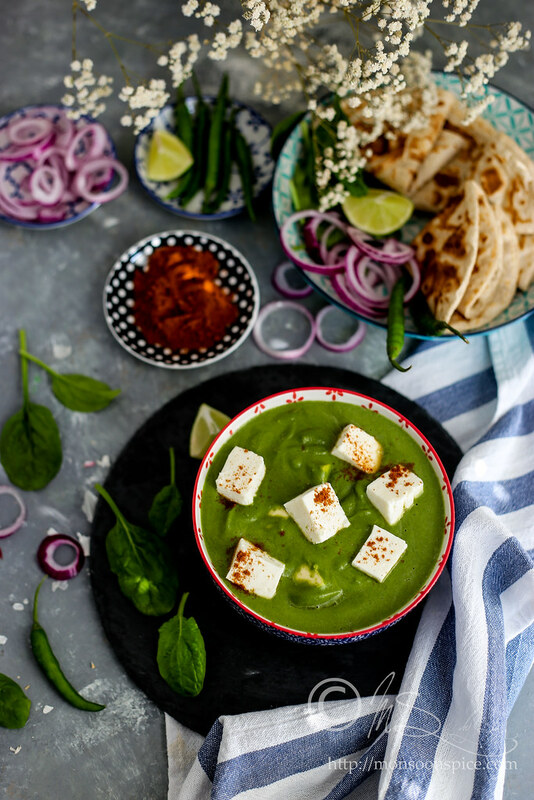 Check my another recipe of Palak Paneer on the blog which is one of the most popular recipes on the blog.